Jessica Morgan introduces the second day of the Global Pop symposium held at Tate Modern in March 2013. The lecture focuses on the traditionally deliberate vagueness in the use of one of the most popular and glamorous notions in art history, and looks for landmarks to map the pre-history of Global Pop and for an external view on this ambivalent phenomenon. Critically addressing the marginalisation of ‘women Pop artists’, this paper illuminates the diverse ‘popness’ and proto-feminist radicality of a number of artists who intersected with Pop in the sixties (such as Axell, Pauline Boty, Rosalyn Drexler, and Jann Haworth) proposing the undefining of Pop Art’s critical contours and an unsung prelude to feminist art and contemporary women artists’ engagement with pop culture. In 1970 the Dziga Vertov Group made Pravda, a film shot illicitly in Czechoslovakia, which accused Soviet-style socialism of succumbing to consumerism. Socialist consumerism was not, however, without its local critics: filmmakers Chytilová, Makavejev and Leszczyński redeployed the visual codes of advertising in their ‘pop’ movies in the late 1960s and early 1970s to confront the alienation and anomie of state socialism in Eastern Europe. Jessica Morgan chairs the morning Q&A session for the second day of the Global Pop symposium following lectures by Walter Grasskamp, Kalliopi Minioudaki and David Crowley. Marko Daniel introduces the afternoon session of the second day of the Global Pop symposium which included talks from Anna Kolos, Theresa Millet and Reiko Tomii. The question of pop art behind the iron curtain remains controversial because it cannot easily fit in the canonical dictionary of art terms premised upon the division between the West and the East. This paper attempts to deconstruct the paradigm of historiography of art referring to the idea of ‘artistic influence’ and point out some examples of what may be called ‘Central European pop art’. This paper reviews the sources and origins of what later was known as Pop in Spain, and that was represented by artists or groups such us Equipo Crónica, Equipo Realidad, Eduardo Arroyo and Josep Renau. Japan offers a rich area of investigation when we consider how Pop Art emerged in a non-Western locale before and after the rise of Euro-American Pop Art: indigenous Pop (Yamashita Kikuji’s Reportage paintings in the 1950s); inadvertent Pop (Akasegawa Genpei’s ‘Capitalist Realism’ in 1963–4); and Pop-inspired Pop (Shinohara Ushio’s Imitation Art in 1964). Art critic Marta Traba declared Pop a style unfit for Latin America. Despite her warnings, artists from Cuba, Colombia and Argentina toyed with the style producing works that went beyond appropriation of commercial imagery. Instead the art revealed a profound rupture of painting’s privilege and fictions of national identity. In November 1985, Robert Rauschenberg’s R.O.C.I. 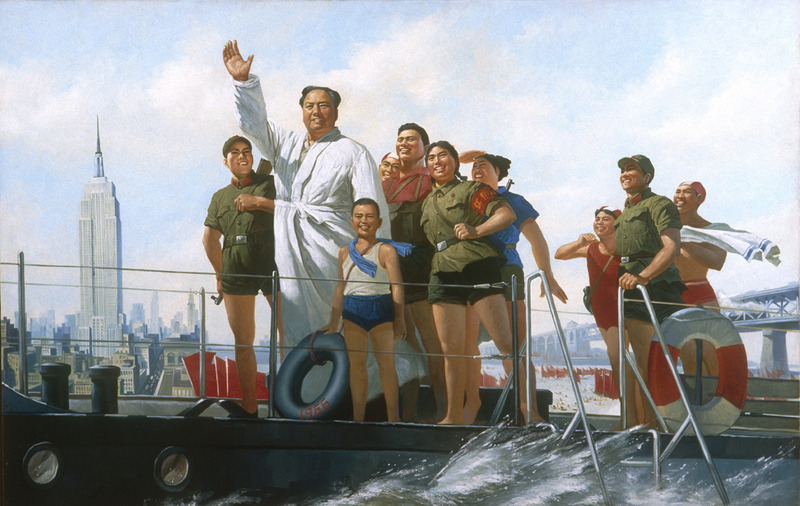 touring exhibition opened in Beijing and brought Western Pop art to Chinese eyes for the first time. This paper investigates the decades before this historical event when pop culture’s engagement of politics in China was predominant, and how this tradition was interwoven with the contemporary art practice after the 1980s. Marko Daniel chairs the final Q&A session of the Global Pop symposium following talks by Anna Kolos, Teresa Millet, Reiko Tomii, Mercedes Trelles-Hernandez and Zheng Shengtian. Day two included talks from: Walter Grasskamp, Kalliopi Minioudaki, David Crowley, Anna Kolos, Teresa Millet, Reiko Tomii, Mercedes Trelles-Hernandez and Zheng Shengtian.